Home / Farmhouse Line / Sheep 4 Inch Tile~A friend from the farm. This fluffy sheep 4 inch tile is sure to make you smile. 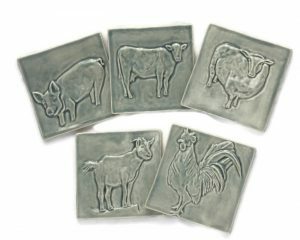 Whether you have a fondness of farm and country or just love these creatures, this sweet tile is for you! Incorporate several sheep tile together in a tile project or pair the sheep tile with the rest of the farm tiles! The options and projects are endless! You don’t have to have the same tile as everyone else! Choose tile that is meaningful to you! What a fluffy Sheep Tile! This 4 inch tile is handcrafted from stoneware clay and high fired for durability. Beautiful in any of Fire Creek’s available glazes but particularly striking in Celadon or Sky. This tile is perfect for the country or farm kitchen and pairs beautifully with subway or white tile. Consider a whole flock of sheep for your kitchen or group them with other tiles in the series, the goat, the rooster, the dairy cow and the piglet! Each tile starts as a slab of clay, hand carved and cast in plaster. Take a moment to read about our tile process HERE. We have several glazes to choose from in our shop. A variety of glazes to match any tile installation and décor. We can help you get the look of your dreams. Fire Creek crafts every tile just for you, so please allow 4-6 weeks delivery. Do you still have questions? You can find answers to our most frequently asked questions HERE. You don’t have to have the same look that all of our neighbors have. Choose the tile that reflects your personality and has meaning to you.